If you’re selling a home, one of the first things you do is evaluate and enhance its curb appeal — the attractiveness of the exterior of the property. If you’re selling the downtown area to shoppers, tourists, business owners, and others, it also needs good curb appeal. Improving Downtown’s Curb Appeal presents seven approaches to enhancing the visual appeal of central business districts. Each was selected because it is relatively low-cost and quick to implement, while making a significant impact on the downtown area. You’ll find two approaches to re-purposing unsightly and underused space, three techniques for encouraging facade renovation, two ways to cut visual clutter, three strategies for reducing unsightly trash, practical methods to reduce panhandling, and four ways to activate vacant and dreary storefronts. These techniques are in use in a wide range of cities including Ann Arbor, MI, Fontana, CA, Harrison, NY, New York, NY, Ocean City, MD, Paso Robles, CA, Portland, OR, Tampa, FL, Victoria, BC, Vineland, NJ, and Wilmington, DE. One of the most widely used approaches to improving downtown’s curb appeal is facade improvement. These programs seek to enhance the visual appeal of the downtown and to provide a financial incentive for businesses to invest in the redevelopment of their property. A major streetscape improvement can be an effective way to enhance curb appeal but for a quick, low-cost fix to an awkward intersection, or an empty lot, there are other solutions. Signage and newsracks are often overlooked contributors to the appearance of the downtown area. Taking steps to develop practical and legal ordinances to cut the clutter and offering incentives are two methods that often go hand in hand in assuring that downtown newsracks and signs are, attractive, legible and consistent with the overall downtown brand. Despite the efforts of downtown leaders, trash and litter continue to plague many central business districts. Just who is responsible for the overall cleanliness of the downtown area? Ideally, the municipal government has ample funds, equipment and staff to keep everything clean and in good repair. But when that is not the case downtowns typically follow one or all four of the following approaches: Hire and train a team of workers dedicated to cleanliness, engage building owners and merchants, host community wide clean-up events, work to change negative behaviors. While not always considered in a discussion of curb appeal the issue of panhandling on downtown streets can have a profound impact on perceptions of cleanliness, safety and personal comfort. Many communities have brought both a hard-headed business perspective and a strong sense of compassion to this issue. Thanks to partnerships between downtown organizations, property owners, the artistic community, and others, unattractive empty storefronts are coming back to life and occupied spaces are sprucing up. There are as many ways to partner, fund and fill storefronts as there are communities with vacant buildings. 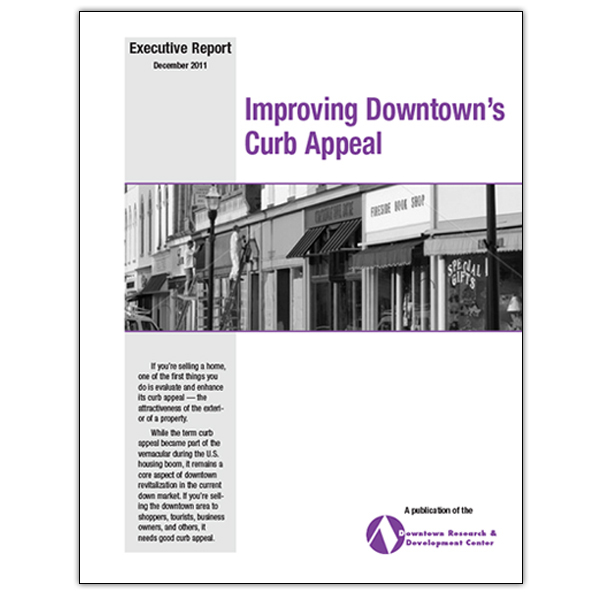 Improving Downtown’s Curb Appeal was researched and written by the staff of the Downtown Development Center. Improving Downtown’s Curb Appeal is guaranteed. If you are not 100% satisfied, you may return it within 30 days for a full refund.